Rotator Cuff Tendonitis is a -dynamic- made up of multiple factors all working together to cause pain and problem. There are four rotator cuff muscles, and four tendons attaching to the 'rotator cuff'. But there's a lot more at play than that. If anybody tells you that the problem is 'that tendon', I'd advise you to keep looking for answers elsewhere, because the problem is always bigger than 'that tendon'. Tendonitis is a dynamic made up of multiple factors. If you have rotator cuff tendinitis, you need to effectively address each of those factors to get your shoulder back into happily working order. No matter where in the body Tendonitis shows up, it is a predictable dynamic with predictable behaviors and predictable symptoms. And it gets quickly or slowly worse and worse. That's the Pain Causing Dynamic. Specifically to rotator cuff tendonitis, you have other structures all around the shoulder that are involved. It's never just a single spot of pain that is the problem....that single spot of pain is really a symptom of the problem. Do you actually have an injured rotator cuff? Or do you just have Shoulder Tendonitis? Most people think that if they have rotator cuff pain they must have a shoulder injury. You either have an actual rip/tear to one or more of the rotator cuff tendons, or you don't. If you do, then there is a rip/tear somewhere on the tendon. This is not 'tendonitis', though there is almost certainly a tendonitis dynamic surrounding the tear. If you do not have a rip/tear, then you do not have an 'injury'. That's an interesting thing about tendonitis, you can have DEBILITATING pain, but no actual injury. Tendonitis can include microtrauma, little teeny tiny wear and tear damage to a tendon, but that's not considered an 'injury'. It's important to know whether you have a tendon tear or you don't have a tendon tear, so that you can think properly about your situation and what to do about it. For instance, if you have an actual tear, but do massage to 'fix' the problem, that's likely to end in more pain and disappointment (depending on the size of the tear and the scenario, it may be doable, but personally I'd lean towards that massage isn't going to fix it like you want it to). If you have an actual tear, you probably need Rotator Cuff Surgery (depending on if you can live with an injured shoulder or not). If you don't then you just have shoulder tendonitis and you can reverse the tendonitis dynamic yourself. Find out more about Rotator Cuff Injury and Rotator Cuff Tear. Should you get Rotator Cuff surgery if you have shoulder tendonitis? If you do not have a torn rotator cuff, then the answer is probably 'no'. If you do have have a bigger than very smal tear, then surgery can stitch it back together. If there is a sizeable tear, it is unlikely that the body will heal it back together any time soon, if at all, and it won't heal back strong, meaning that it will most likely tear more/tear again. +Question: If you -don't- have a torn rotator cuff, then what exactly is the surgeon going to do that is going to fix the tendonitis? Strength is NOT an issue! Doctors presribe physical therapy. Physical therapists have you do 'stretching and strengthening'. The problem with that, of course, is that if you do have weakness it is NOT because your muscles etc are weak. It is because your muscles are not functioning properly, and thus can not perform the usual amount of work that they should be capable of. It's not semantics, and your doctors and physical therapists should know this. Making a muscle that can't work very well work more isn't going to fix the problem that is keeping the muscle from working well. Maybe you are one of the people that has spent months and/or years visting doctors and PT's yet your shoulder still isn't any better. There's a good reason for that. Well, actually, it's a bad reason, but it's a reason nonetheless: you haven't been told the right things to do to reverse the problem. Whether your rotator cuff shoulder pain is new or old, it's time for some effective rehabilitation. You can go see doctors and PT's. Admittedly I'm a wee bit biased against that option because many (most?) of the people I work with have already gone that route and it didn't work for them. I'm a fan of you rehabbing your shoulder at home, and doing it with the RIGHT methods (meaning, 'effective' methods). You'll save a lot of money and learn skills you can use the rest of your life. 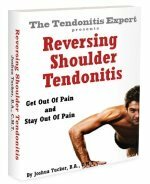 Start working with the Reversing Shoulder Tendonitis program. Return to the top of this Rotator Cuff Tendonitis page.